This past weekend, three trillion people across the galaxy watched the Super Bowl, hoping to see some fireworks between the two head coaches, brothers John and Jim Harbaugh. However, much to our dismay, at no point during the game did their mother run onto the field to break up a fight. But aren’t siblings supposed to be ultimate rivals, just like Scots and other Scots? After a brief stint as ‘real’ journalists, my Muppet sidekick and I are back with our choices for the most raucous rivalries in sports. Honourable Mention – Jets vs. Sharks: Sounds like a pretty weak NHL rivalry, right? 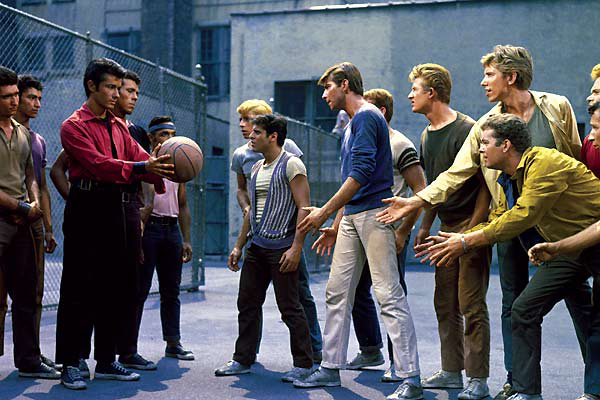 Actually, I’m talking about the gangs from West Side Story. Gotcha. 10) The NFC North: The Packers, Bears and Vikings have been embroiled in a bitter three-way rivalry for decades. Oh, the Detroit Lions are in this division too. Good for them. 9) Wallabies vs. All Blacks: The battle between these trans-Tasman rugby powerhouses has seen its fair share of big hits, thrilling matches and, of course, infamous turncoat Quade Cooper. 8) Cubs vs. White Sox: You think a cross-town rivalry is intense? Imagine being a fan of both Chicago teams, like a certain journalist’s beloved uncle. 7) North Carolina vs. Duke: Only eight miles of Tobacco Road separate these college hoops rivals. Choose your allegiance wisely. 6) Lakers vs. Celtics: This NBA rivalry reached its zenith in the 1980s with the Magic-Bird showdowns and is still going strong today. 5) Muhammad Ali vs. Joe Frazier: These pugnacious pugilists battled it out in three of history’s most legendary fights, yet Sly Stallone is the one that gets a statue. 4) Dalhousie vs. hockey: First they tear down the rink, then they cancel the women’s team’s season after a scandal. What’s next? No more Tim Hortons and puppies? 2) Red Sox vs. Yankees: Nuf Ced. 1) God vs. Cleveland: To quote Scripture, “For God so hated the city of Cleveland that he gave them his one and only LeBron, that whoever believeth in Him shall be heartbroken when He taketh his eternal talents to South Beach.” And that passage doesn’t even mention the Browns and the Indians. Can I get an aw, man! Contest alert: Do you have a brilliant suggestion for the next Ben’s Ten topic? Submit your ideas via the Twitter with the hashtag #BensTen to @dalgazette or @dalgazettesport, or you can comment on the article online at dalgazette.com. The winner will be featured in the next column and get a free large iced capp. The loser must buy me an iced capp. Best of luck! I’d like to see a Top Ten Uniforms column. And for my prize, may I have my Capp “hot”? It’s pretty chilly back home! You missed out on many football (soccer) rivalries that far top some of these. Though a few are really good ones, a little research next time would help.